If your network settings are incorrectly configured, then the NetMeter may not respond on the network. The original factory default settings may be temporarily restored using the procedure detailed below: Restoring Network Communication. If you're having problems establishing network communication then consult the Network Troubleshooting Guide. The Local Area Network Setup section controls how the NetMeter will appear on the network. MAC Address: this number is unique for each NetMeter and is hard coded into the hardware. the MAC Address is also used as the serial number for the NetMeter. It cannot be changed. Host Name: this is the name that will he be used to identify the NetMeter on the network. Each NetMeter (NetMeter-3P, NetMeter-OMNI, etc.) on your network should be assigned a unique host name. 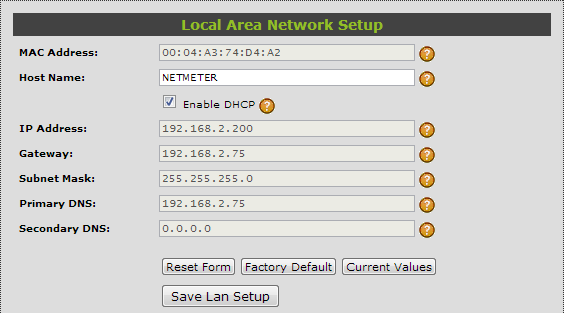 Enable DHCP: when enabled (default), the NetMeter will automatically obtain an IP address from a DHCP server. Generally, it is recommended that each NetMeter-OMNI be assigned a static IP address by your IT administrator. Consequently, this box will not be checked. IP Address: for static IP address set up (DHCP disabled), the desired IP address should be entered here. Gateway: for static IP address set up, the address of the Gateway should be entered here. All NetMeter's connected on the same network will typically have the same subnet mask. Subnet Mask: for static IP address set up, the subnet mask should be entered here. All NetMeter's connected on the same network will typically have the same subnet mask. Primary/Secondary DNS: these are set to the addresses for the domain name servers as specified by your network administrator. For NetMeter's on the same network (or segment of the network), the Gateway, Subnet Mask, and DNS settings will be the same for all NetMeters. However, each NetMeter requires a unique IP address. Make sure you press the Save Lan Setup button to save any changes to this section. if you're not sure how to set up the Gateway, Subnet Mask, and DNS settings, then first attach to the network using the default DHCP and then press the Current Values button to automatically load these values based on the information from the DHCP server (these are probably the correct values). You can then disable DHCP and change the IP address as determined by your system administrator. Here the Administrator Password may be changed. Make sure you document any changes to the password. If you forget the password, the Restoring Network Communication procedure will temporarily restore the default password. Here you can set the landing page (home page) of the NetMeter. You can select one of the presets or type in a home page path. One of the home page options is to use custom HTML. For this option, select one of the 4 available HTML pages and then press Save Homepage Setting. By default, anyone on your local network can access the data from the NetMeter and only setup pages require a login. User Management can be used to restrict access to the NetMeter-OMNI so that either local users, remote users, or both require a username and password. Clicking the Fast Blink the LED button will cause the heartbeat LED to blink at an accelerated rate for several seconds. This can be used to visually identify that you are communicating with the intended NetMeter-OMNI. If network parameters are incorrectly set up, then communication with the NetMeter may fail. It is possible to temporarily restore the default values of the network configuration. This procedure also temporarily restores the default administrator password. WARNING: before proceeding with network default recovery, disconnect all sources of power and verify that they are de-energized and locked out. Failure to follow these instructions may result in personal injury or death, property damage, or economic loss. With the power off, momentarily ground the RESET pin on the ZCAN connector (bottom left of NetMeter-OMNI, next to the Ethernet connector). This is done by connecting pin 3 to pin 4 of the ZCAN connector. 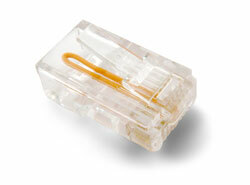 Z3 Controls provides a special RJ45 plug for this purpose (called a "Reset Plug" as pictured below). Safely power on the NetMeter-OMNI and connect using the factory default network parameters. Disables the user defined admin password so that the default (z3controls) can be used. Sets the network configuration to the factory default with DHCP enabled. Remember: the use of the reset plug is only temporary! After using the reset plug, the network settings will temporarily revert to factory defaults when the NetMeter is powered on. However, if the NetMeter is subsequently power cycled or reset, it will boot up with whatever settings are in the LAN/Network Configuration. Consequently, the LAN/Network Configuration settings should be changed, as required, while the NetMeter is in the temporary default state. If you're having problems connecting to the NetMeter then refer to the network troubleshooting guide.